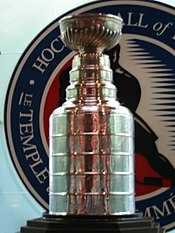 The 1991 Stanley Cup Playoffs for the National Hockey League (NHL) championship began on April 3, 1991, following the 1990–91 regular season. The 16 teams that qualified, from the top four teams of the four divisions, played best-of-seven series with re-seeding after the division finals. The Conference Champions played a best-of-seven series for the Stanley Cup. This was the first of the 25 consecutive years in which the Detroit Red Wings qualified for the Stanley Cup playoffs until their streak finally ended in 2017. Their streak is tied for the third longest in NHL history, and was the longest active playoff appearance streak in the four major American professional sports. The finals concluded on May 25 with the Pittsburgh Penguins winning the Stanley Cup, defeating the Minnesota North Stars in the final series four games to two. Pittsburgh forward Mario Lemieux was awarded the Conn Smythe Trophy as Most Valuable Player of the playoffs. This was the first NHL playoffs without any series sweeps since the 1972–73 season. In addition, this season set the record for most playoff games played with 92, which stood until 2014. In the 1990–91 season, teams qualified based on their division standing at the end of the regular season. Playoffs then proceeded among the top four teams in each division, providing a division winner. The two division winners of each conference then played off to provide a conference winner. The two conference winners then played off in the final to produce a Stanley Cup champion. Minnesota's series victory was the first time since realignment in 1981 that the Clarence Campbell Conference was not represented by a Canadian or Smythe Division team in the Stanley Cup Finals. ^ Mike Zeisberger – The Toronto Sun (June 14, 2014). "NHL playoff highlights during this lengthy post-season". Retrieved July 2, 2014.